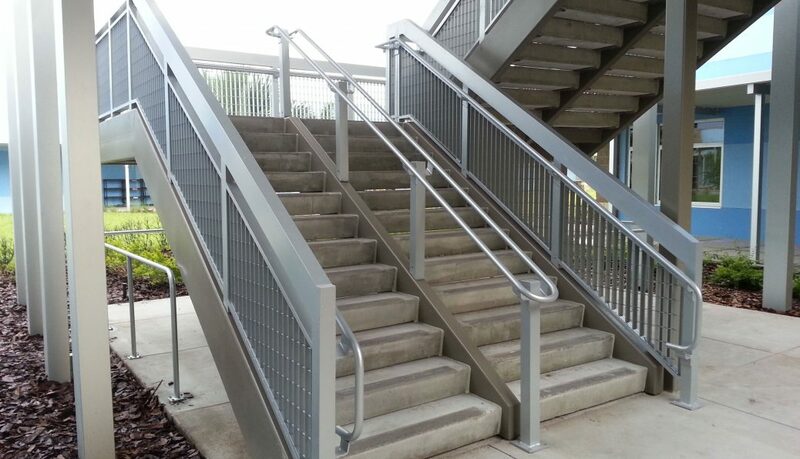 Seco South was contracted by The BECK Group to manufacture and install 1,100 feet of a custom aluminum handrail system for the new Dawson Elementary School located in Riverview, Florida. This project consisted of a fully-welded aluminum frame manufactured from 3"×3" vertical post and a 3"×6" top cap. The architectural firm of Holmes Hepner & Associates chose a unique aluminum grill design for the handrail infill which was manufactured by Ohio Gratings and integrated into the railing framework by Seco South. The challenge was to install this aluminum railing on steel stringers and embeds. To achieve this we welded stainless steel support legs to the steel. The aluminum railings were then slipped over the support legs and secured with a decorative stainless steel fastener. The finish on the railing system was a silver anodized powder coat finish. The entire 1,100 feet of the railing was manufactured and installed in 5 weeks. Site design by: Refueled Inc. Select a product catagory and complete the form to receive a 5% off coupon code!